The “bones” of a garden are usually provided with two very different features: hardscape and shrubs. I’ll leave the hardscape to another post and address shrubs for now. I think the thing I find the most essential in a perennial border or garden space is variety of heights. Even when my garden was very young, I appreciated the completely accidental feature of taller perennials interspersed with masses of low-growing self-seeded alyssum. Controlled Chaos under the shade of big cedars. 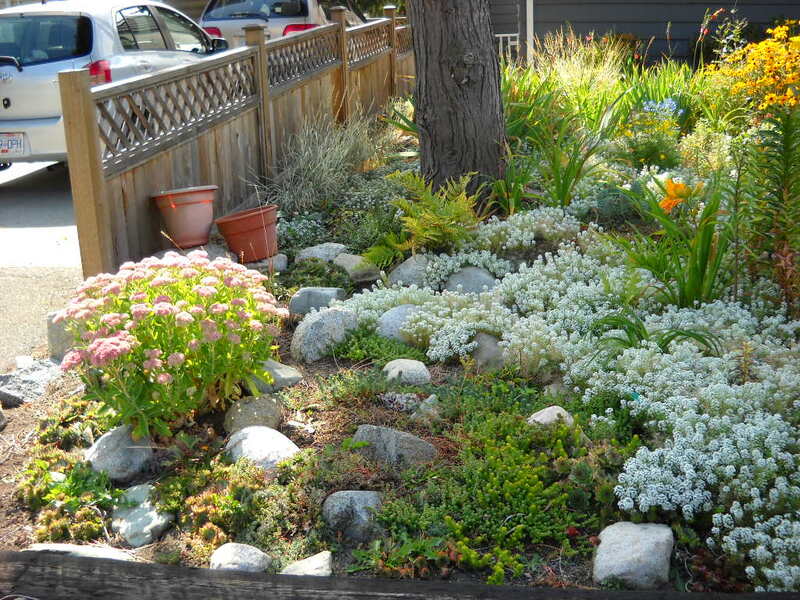 The garden looks nothing like that now, but I haven’t abandoned that layered look–now it’s achieved with shrubs. Your avian friends will appreciate the varying sized shrubs, some liking to be up high, others liking to just perch a couple feet off the ground. The more heights your garden has to offer, the more species of birds you’re likely to invite. 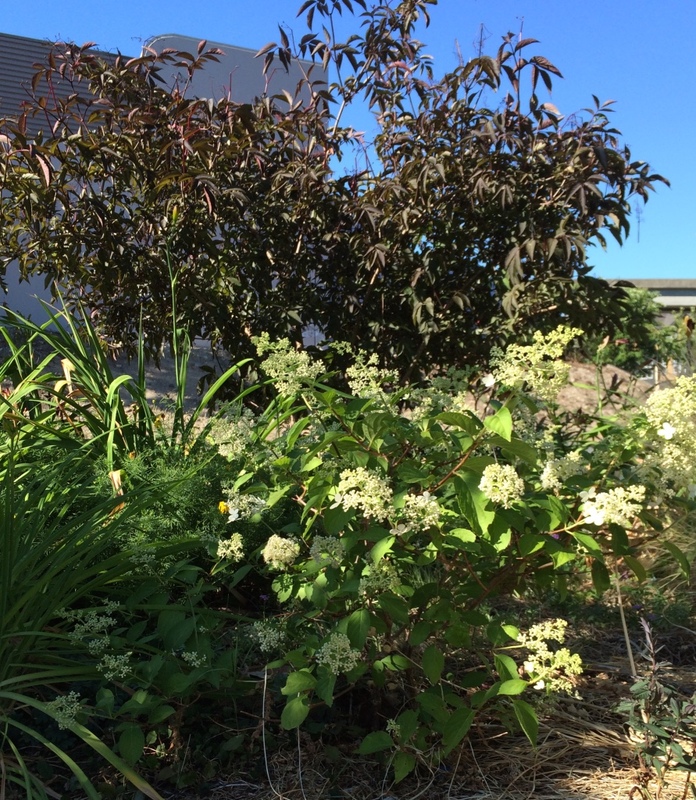 Tiny (stunted actually) Hydrangea paniculata ‘Brussels Lace’ in front of Sambucus nigra ‘Black Beauty’. Aaack!–way too much enclosure. The Sambucus is getting “shovel pruned” this summer, the hydrangea, small lilac and both rhodos will be moved, the older lilac pruned back a bit, the Hibiscus limbed up. Aah, now there’s room to breath, yet still fell comfortably “secret”. 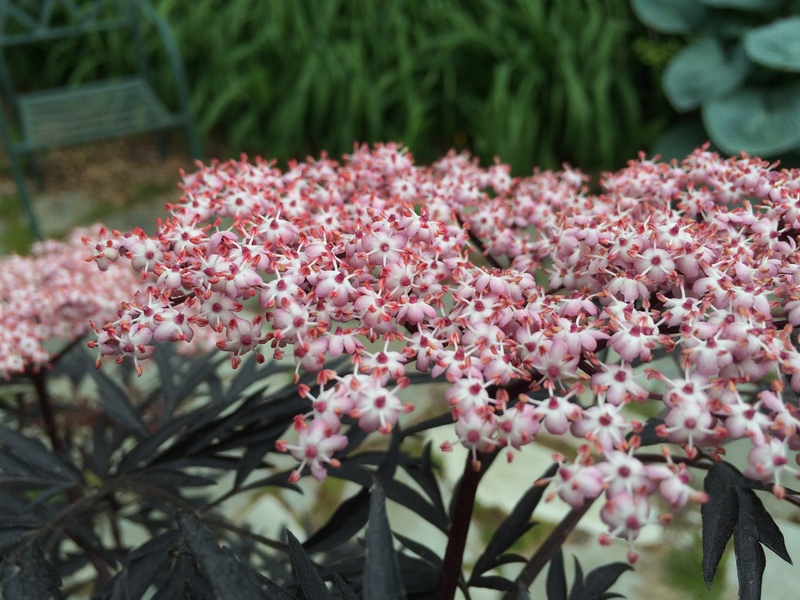 But speaking of drama (the Sambucus ‘Black Lace’), a few shrubs with interesting detail, texture, colour, or flowers will contribute a certain je ne sais quoi to your garden. 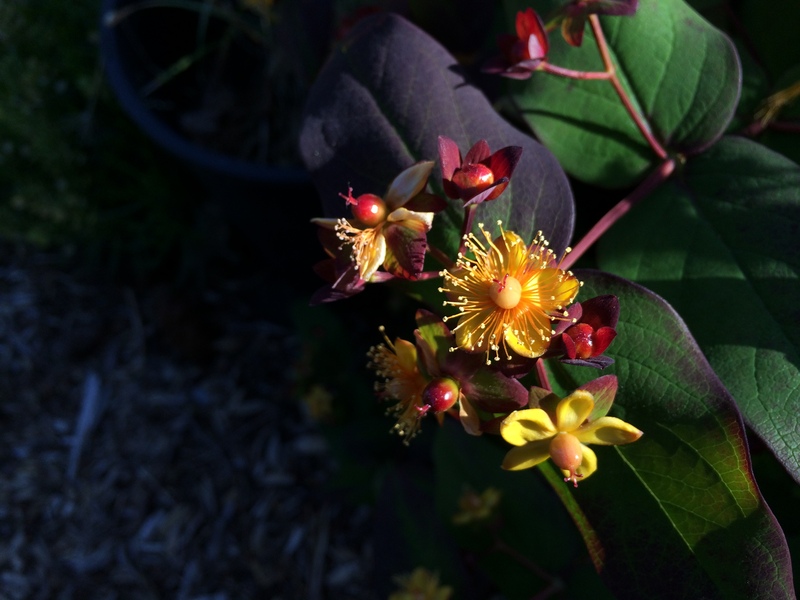 Hypericum perforatum ‘Albury Purple’–used as a perennial, but it’s really a woody sub-shrub. Growing about 24″ high in my garden, and at about 4 years old, it’s grown a bit bigger every year. Just as a comma or question mark helps define a sentence, so a shrub can help define a garden space. Back to my Sambucus nigra, being very dark in colour, it provides a great backdrop to the white lilies growing underneath, which aren’t in bloom any more, so I can’t show you. 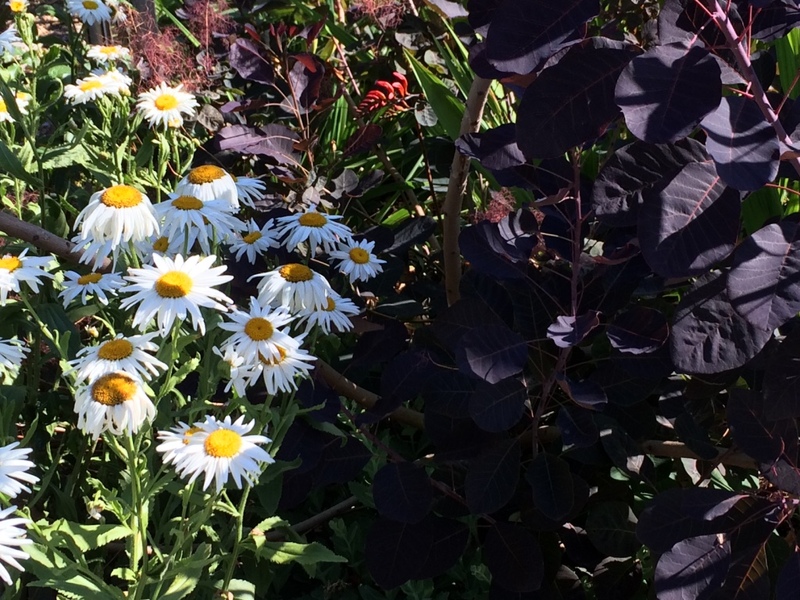 But I can show you the Cotinus coggygria ‘Royal Purple’ providing a foil for the shasta daisies. Like quotation marks, perhaps? For some of us, winter is a long season. Not so much here on the West Coast, but most of the rest of the country. So your garden should still be attractive and inviting for those 4-5-6 or more months between growing seasons. Shrubs will do that for you. Deciduous shrubs still have a network of delicate branches that you can appreciate all the more for not being obscured by leaves. (That sentence is a little like an old friend from a tree-challenged region of Scotland who felt the view as we drove south to England was hidden by too many trees!) And of course, evergreen shrubs provide colour when we most need it, and sometimes even fragrance–like my beloved Sarcococca humilis that blooms in early February, and fills the front entrance of my house with amazing fragrance. 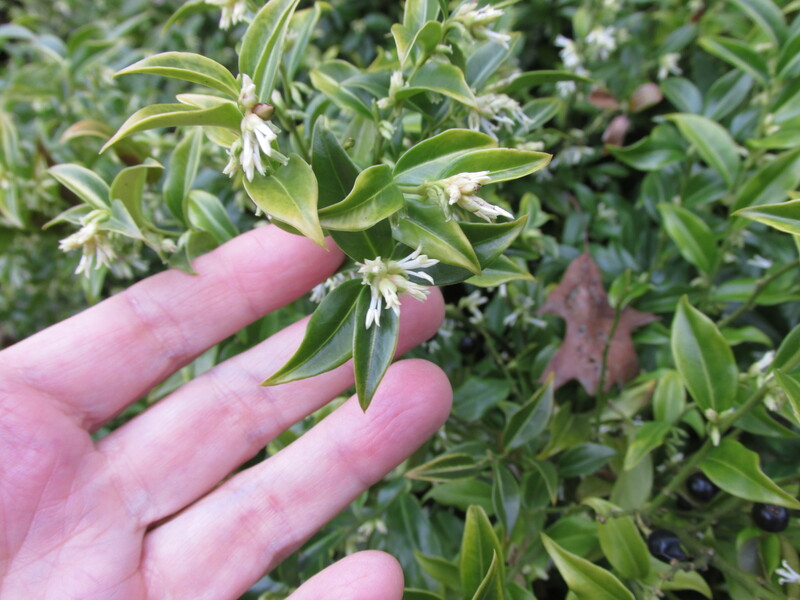 Sarcococca humilis–Tiny little flowers, big impact! If you want to consult RLGS to establish some structure in your garden, go to the About/Contact page. PATHS AND STRUCTURE AND MULCH, OH MY! 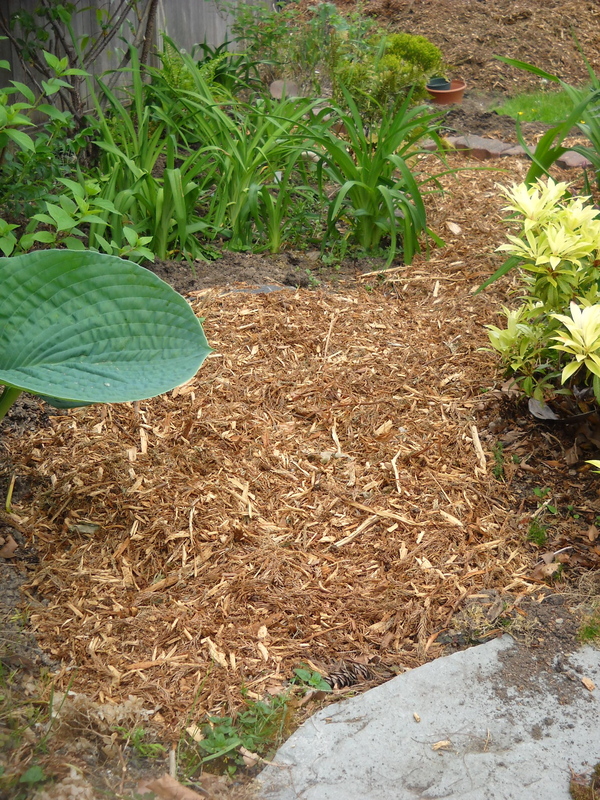 Five days and untold number of labour-hours later, the mountain of mulch is gone, and a new one has appeared. Most of the mountain has been translocated to a spot behind the carport. It’s almost 5′ high, 10’across. That means probably about 8 cubic yards. Further to my post of May 6, my plan was to use as much as I could making paths through the garden. Having done that–and more than I’d originally planned– I’m really happy with the result, because it gives the garden structure. I didn’t even know it lacked structure! But now I feel like the paths give flow and intentionality to the garden, leading from one area to the next, pretty much a complete circle around the yard. 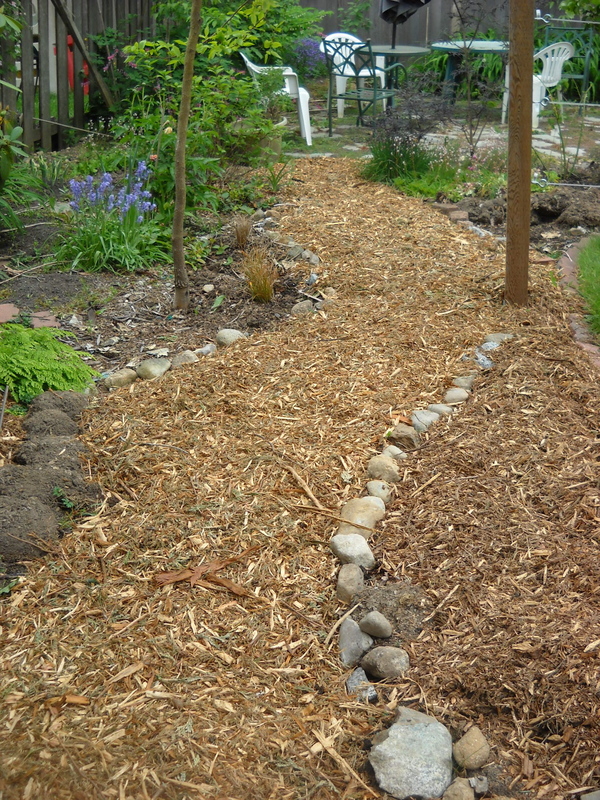 The path is to the left, the right is currently potato bed and will be a shrub border in the fall. 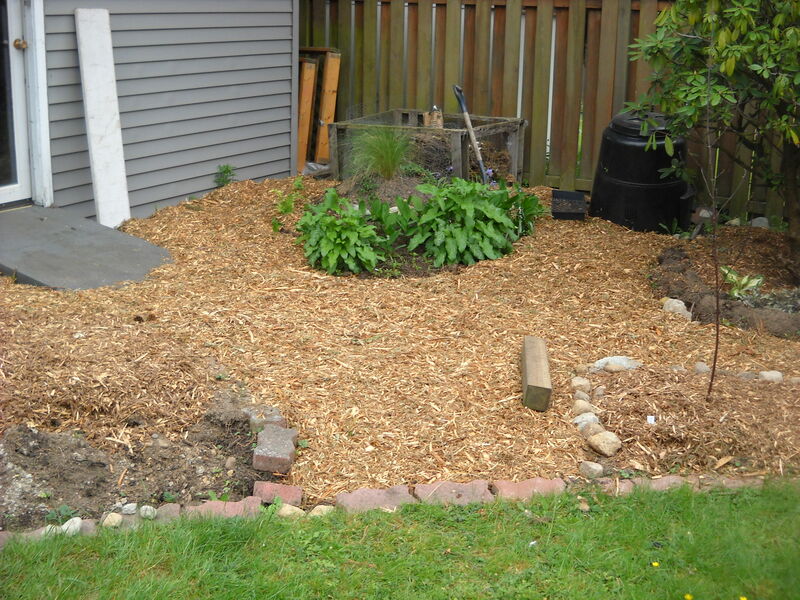 … where the path then goes along the back with a perennial border next to the fence, and vegetable beds to the right. It meets the back patio. After leaving the pation, we welk along the west fence, with shrubs to the right and left, and a lot of perennials throughout. 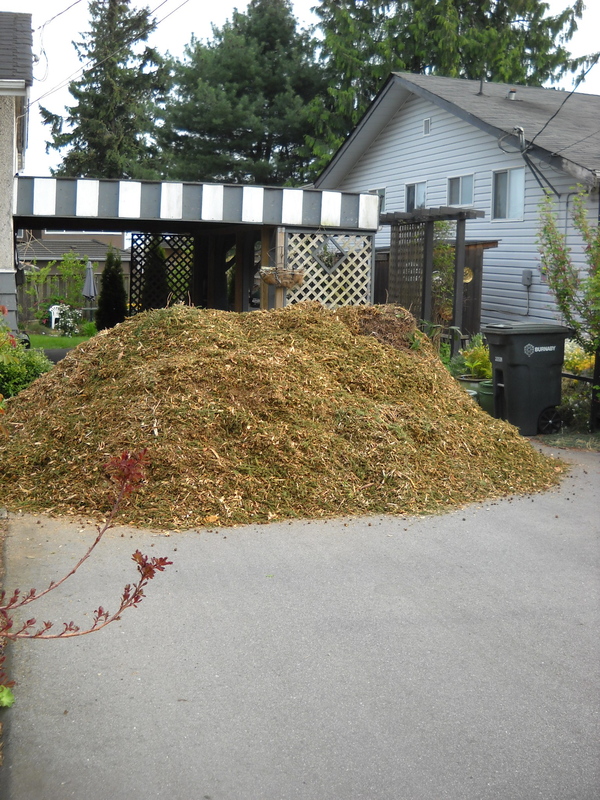 …finally meeting up with the “translocated mountain of mulch”! So, if you feel your garden is lacking some kind of … something… consider paths.